William Frederick "Buffalo Bill" Cody (February 26, 1846 – January 10, 1917) was an American scout, bison hunter, and showman. He was born in Le Claire, Iowa Territory (now the U.S. state of Iowa), but he lived for several years in his father's hometown in Toronto Township, Ontario, Canada, before the family returned to the Midwest and settled in the Kansas Territory. 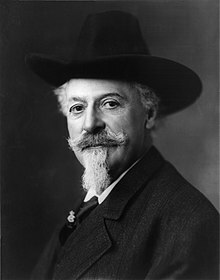 Buffalo Bill started working at the age of eleven, after his father's death, and became a rider for the Pony Express at age 15. During the American Civil War, he served the Union from 1863 to the end of the war in 1865.